Green Moong curry is the best curry that one could ever have. And the reason why I am telling you this is because irrespective of all the fancy food one could ever have, the one that satisfies you and makes you feel warm from within is the one that is home made and which also is effortless. Growing up there were times when the adults of the house forgot to refill vegetables because of their busy work schedules. And this was noticed mostly on the days when there was hurry to get to work. I used to live in an area which was still developing and there were no legit grocery stores nearby.The luxury of ordering my list of veggies and groceries on a tap of finger never existed those days. 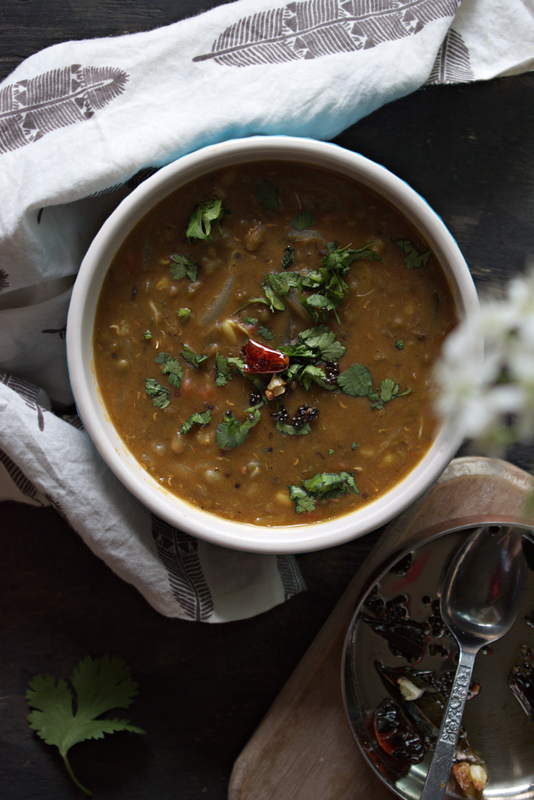 So on such days, this green moong dal curry came to rescue. Mother would put this green moong dal on pressure cook while she bathed me, got me ready for school and made chapatis. Until then fresh and creamy curry was ready to be packed into each of our tiffin boxes. The curry was not runny but had that gooey, melt in mouth texture. You know how you feel when you eat a milk based pudding, how it melts in your mouth, this curry had the same texture. Eventually the area where I lived developed to such an extent that now fresh veggies are delivered at doorstep straight from the farm. But we do miss those days and laugh about it. About how some meals were made in stressful times with makeshift ingredients but yet was home made and had oodles of love into it. Mom still makes this curry till date and now I have carried on the legacy. I find comfort in this warm bowl of curry that reminds me of home, of the times that we were clueless of what lies ahead of us and that we made it through those days with lots of memories and hearty laughs. 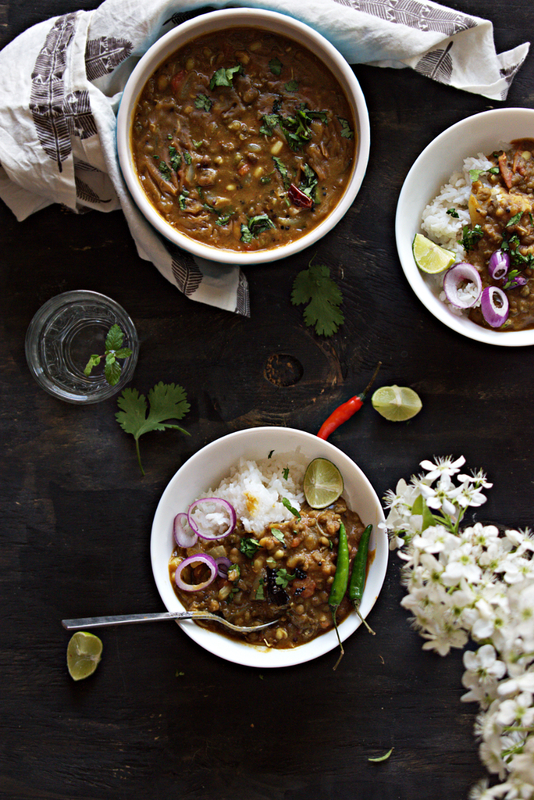 Green Moong curry is one pot meal that can happen in just 30 mins. The curry that nourishes the soul and is absolutely filling and you don't even need to soak it for a day or wait for it to sprout. Soak green moong dal for 10 mins in water. Add mustard seeds and curry leaves and let it crackle. After that add hing and turmeric and immediately add chopped onions. Saute the onions until translucent and then add chopped tomatoes. Let it cook for sometime and then add green moong dal. Add 3 cups of water and chili powder, garam masala and salt as per taste. Close the lid and pressure cook it for 3 whistles. Turn off the flame, let off the steam and serve hot with hot rice. Because the green moong is not soaked, it is highly recommended to pressure cook it than open pan cooking.